Hi all! I just have to share my excitement (and SHOCK!) on an announcement that was made over on the MFT Blog earlier today... I was selected as one of their 2015 Card Design Superstars!!!!! 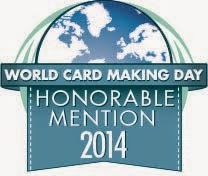 I am still truly surprised and completely FLOORED that one of my cards was chosen!!! 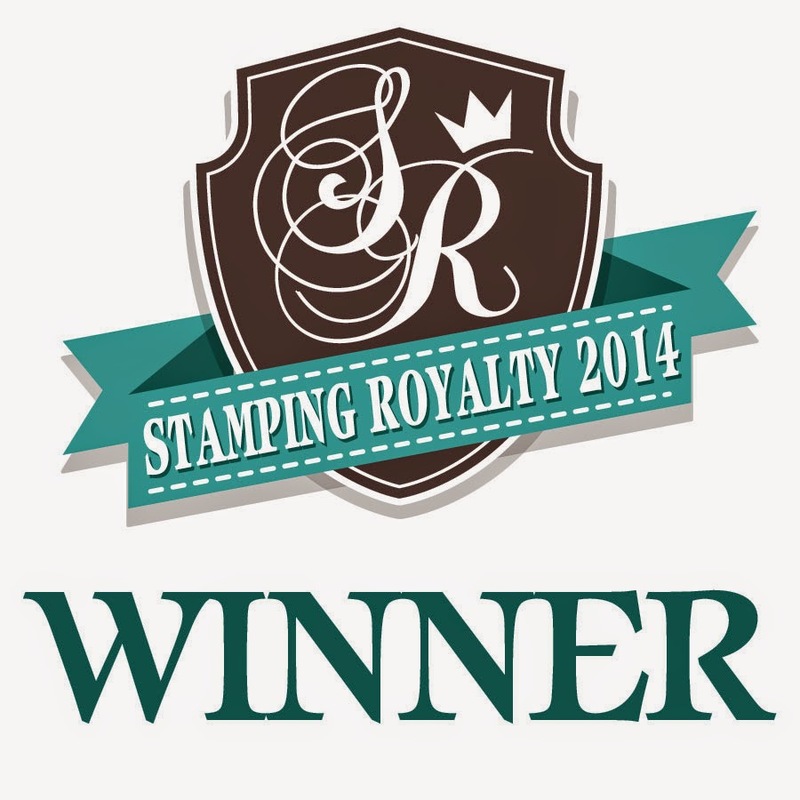 You can read all about it - - - > HERE as well as see the other winners. So many AMAZING cards!!!! Big HUGS to all the wonderful MFT ladies!!! Hi all!!! 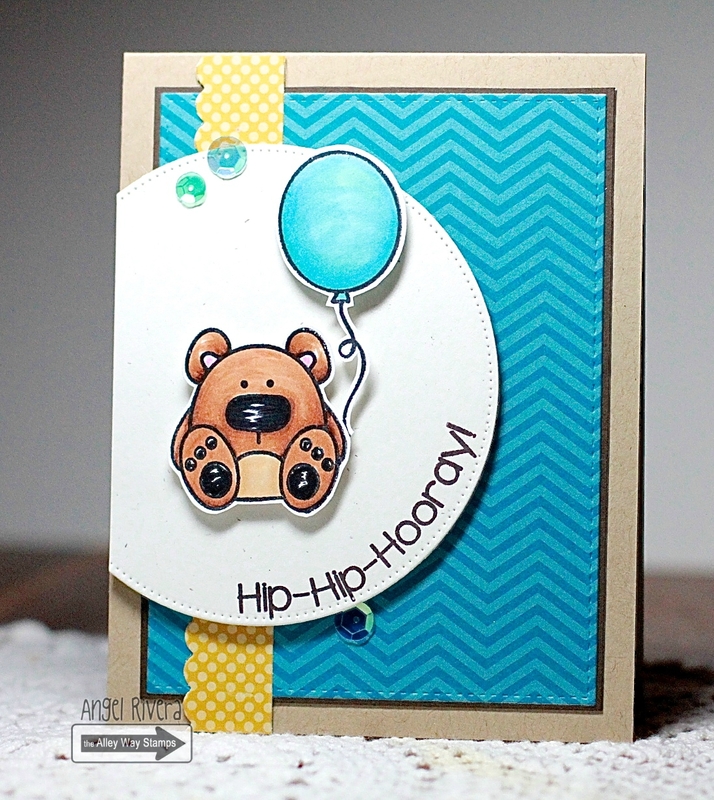 Welcome to the TAWS New Release Blog Hop! You have so much to see on this hop, so let's get to it! My card features the new set called Sweet Thing. This is a sentiment set that has several large words in such a cool font, along with some companion words in a simple font. SO FUN! 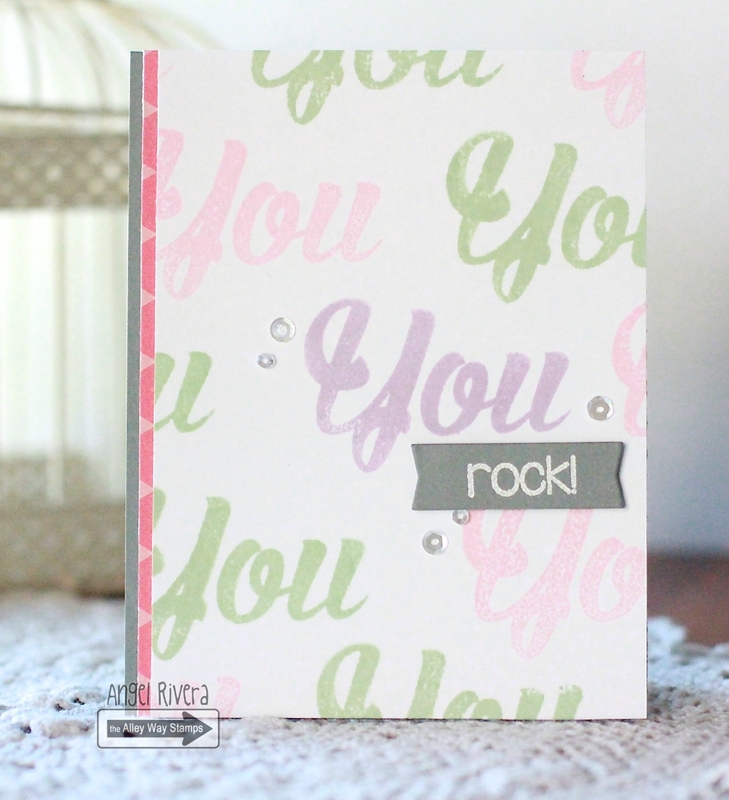 I stamped 'You' in 3 different inks, then embossed 'rock!' on steel blue card stock. A few clear sequins and done! SO cute, right??!!! 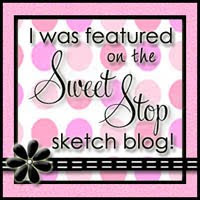 Ok, head on over to Archana's Blog! Don't forget to comment on the TAWS BLOG for your chance to WIN!!! Hi all! 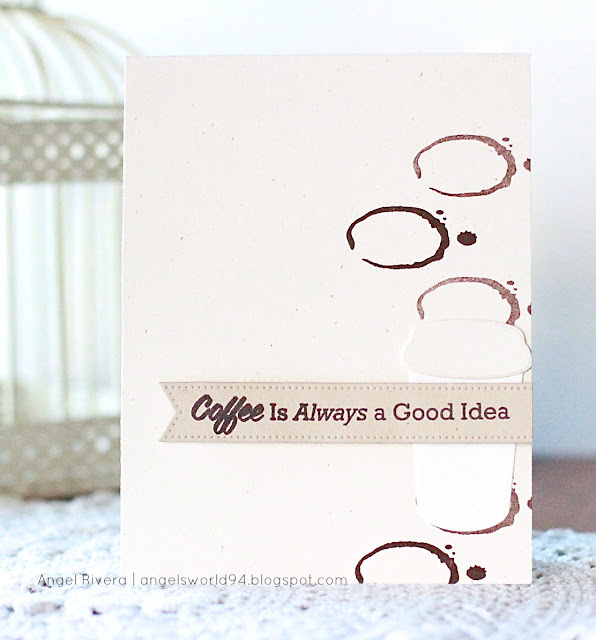 Here's another card for the Fall Coffee Lovers Blog Hop! I broke out this oldie but goodie from Totally Stampalicious. This woman sums up my mood just about every morning, lol! I colored her with Copics, then used the SSSC288 sketch. Don't forget to check out my other coffee hop card - I have a giveaway!!!! Hi all! Welcome to TAWS Sneak Peek Day 3! I sure hope you've been hopping along the past two days checking out the sneak peeks because well, can you say CUTENESS??!!! 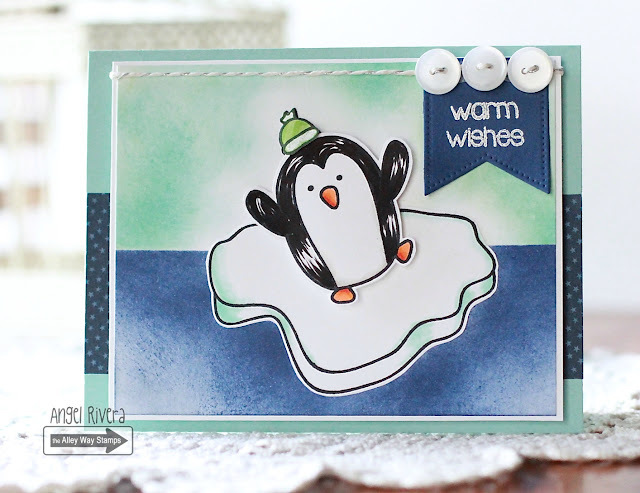 Today we are featuring the new set called Waddle Pals! Talk about a super cute penguin set - love it!!! I colored up one of the penguins and colored him with Copics then added a paper pieced hat. Of course, I had to place him on a chunk of ice from the FREE when you spend $40 set called Chilly. :D I sponged the background and embossed the sentiment on a pierced fishtail flag STAX. A few buttons and some silver and white twine finish it up. Thanks for stopping by! Be sure to swing over to the TAWS Blog and comment for your chance to WIN!!! Coffee is always a good idea and a Giveaway!!! Hi all! 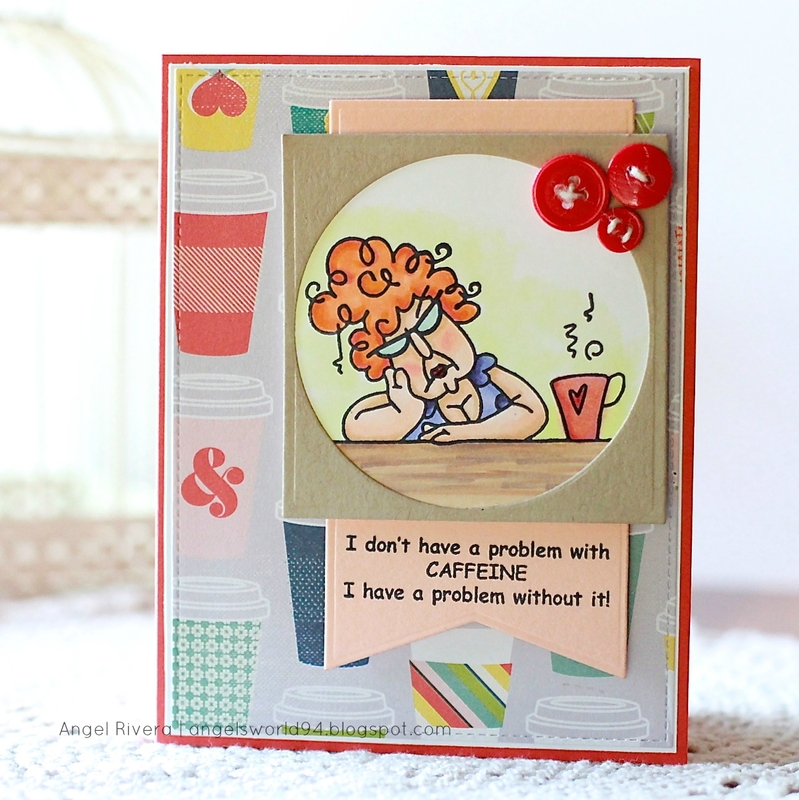 Here's a card I made for the Fall Coffee Lovers Blog Hop! I always love participating with this fun group! Now for the giveaway!!!! How does a copy of the Creative Cards magazine Vol. 1 by Scrapbook & Cards Today PLUS a set of dies sound???!!!! Hi all! Here's a card I made for a two challenges - CTD361 and MFTWSC247. I first watercolored my background with two Ranger distress inks (twisted citron and mustard seed), then cut it out with the four way chevron cover up die-namic and layered it over some primitive white card stock. I thought these gnomes could use some love, so I colored up this guy from the You Gnome Me set with Copics. The sentiment is also from the set, except that I had to selectively ink up 'Friend' from one of the sentiments to go along with the 'Hello'. I stamped them on one of the Blueprints 1 elements ( I used this one quite a bit!). Hi all! 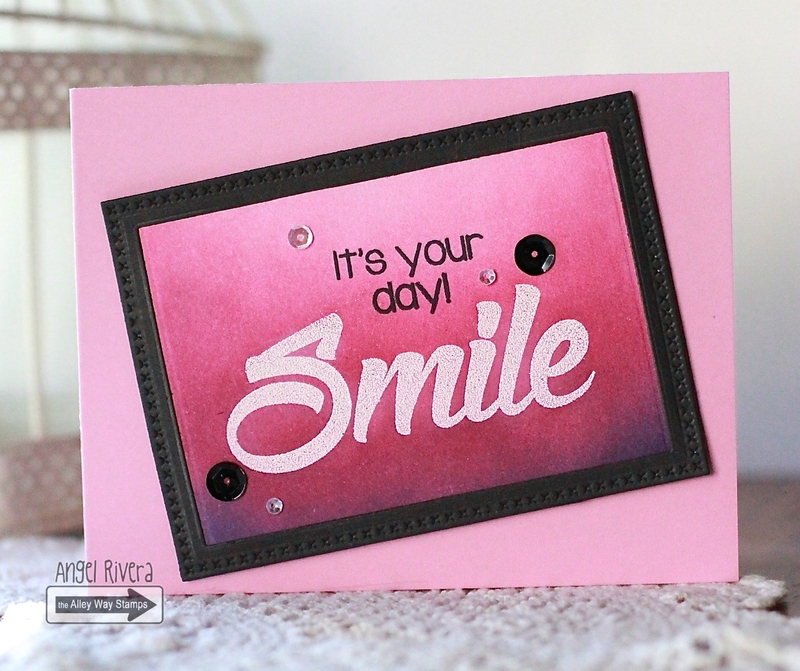 Here's a fun card I made using a few TAWS sets - Big Time, Flap Happy and a slightly older set called Express Yourself. I embossed the word 'Party' then used the out of the box technique and cut it across the top. I really like how it turned out and need to use this technique more. *side note: I don't know what's up with my embossing - is it the ink or the powder? It didn't come out very well and I used an embossing buddy to help with the stray powder but still have issues. Think I'll head to my LSS for different powder and maybe a different white pigment ink pad... Ok, just had to vent, lol! I colored one of the birds from Flap Happy with Copics, then fussy cut him. He looks like he's already partied too hard and needs some sleep, ha! Hi all! Here's a card I made using the FREE when you spend $40 TAWS set, Party Pooper, with a sentiment from an older set called Yappy. 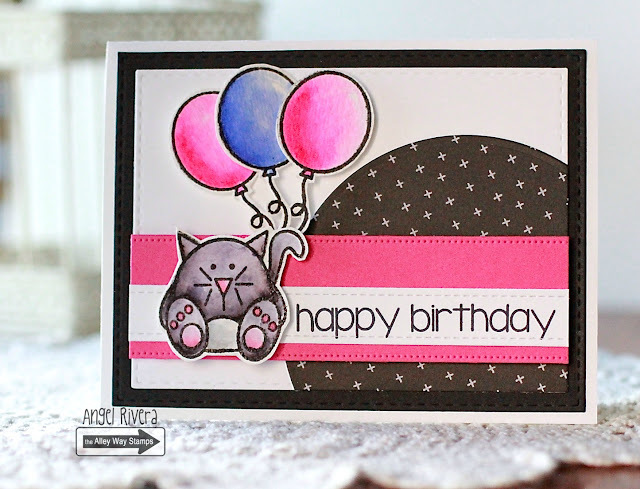 I embossed the kitty and balloons on watercolor paper, then colored them in with my Zig pens and an aqua painter. I then fussy cut them all and popped them up on foam adhesive. The sketch is from the SSSC287 and I used the colors from the CTD360. Thanks for stopping by! Hop over to the TAWS Blog for more inspiration! Hi all! Here's a card I made for the MFTWSC246. I cut my kraft card base to 4 1/2 x 4 1/2, then used the Positive Sign stencil and modeling paste to emboss the center of it. I had a piece of acetate that already had the circle cut out of it, so I used that to mask off the stencil. Once the paste was dry, I used grape jelly, Blu raspberry and sour apple inks and a sponge to color the white paste. The sentiment, from the Birthday Bears set, was embossed on black licorice card stock. Hi all! Here's another card I'm entering into the MFT Card Design Superstar contest. 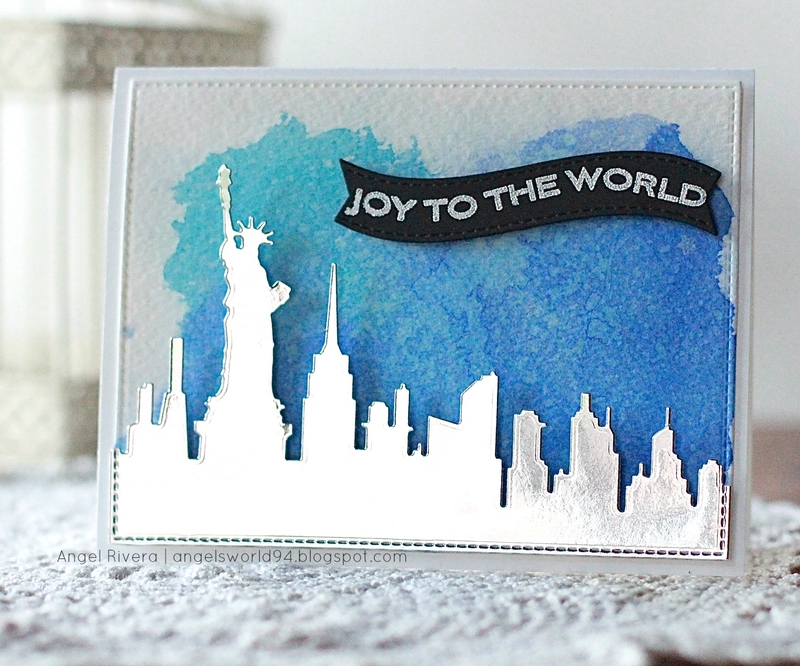 I couldn't wait to use this new New York Skyline die! Hubby was born in NY and still has lots of family there, so I knew this would make for some awesome Christmas cards this year! (yay for getting another Christmas card done, right!?) I cut the skyline out of silver foil paper and used the large rectangle in the Blueprints 13 to cut out the watercolor paper, as well as the edge of the skyline so that it matched up. I used two different Ranger distress inks to create the sky. The sentiment, from the DC Ornament Banner Builder set, was stamped onto black licorice card stock that was cut out with a Blueprints 25 elements then embossed with white EP. The sentiment and skyline were adhered with foam adhesive. The card base is smooth white card stock. Hi all! 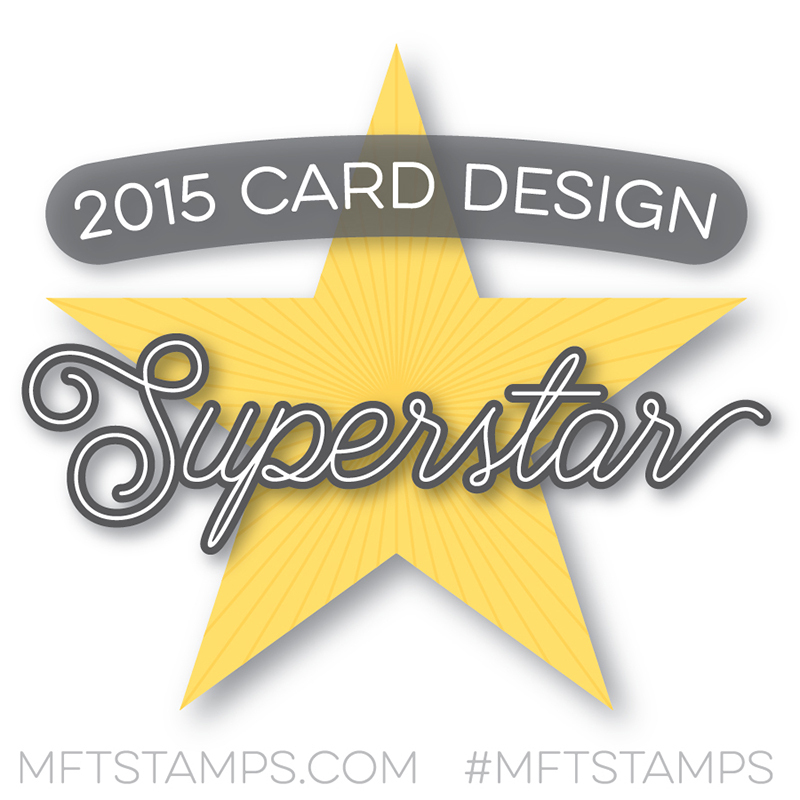 Here's another card I made for the MFT Card Design Superstar card contest. 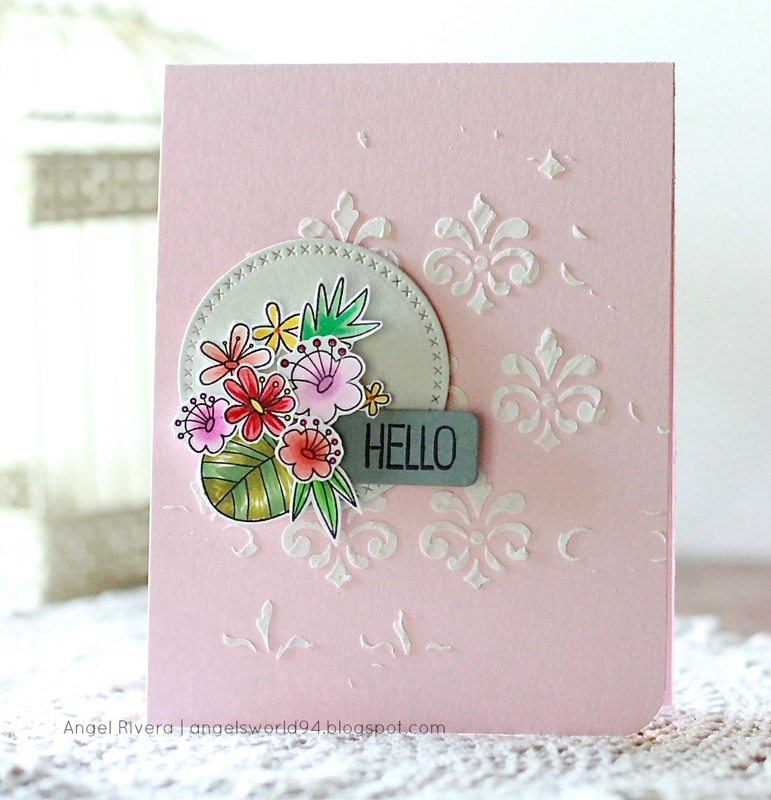 I used the gorgeous and newly released Etched Flower background stamp. First, I embossed on it onto some watercolor paper (in liquid platinum EP) and also a piece of smooth white card stock (in clear EP). On the watercolor paper, I colored in a particular flower, a leaf and a stem with my Zig pens, then cut out what I had colored. I used on of my favorite Blueprints - #20 - to cut out the smooth white card stock then adhered it to my banana split card base with foam adhesive. I then placed the watercolored flower over the same part of the smooth white card stock where it belonged. 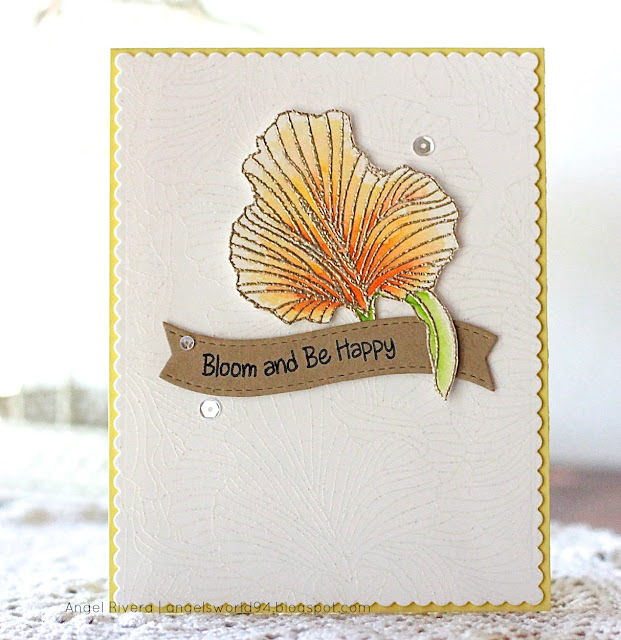 The sentiment is from the BB Sunflower Sweetheart set. I curved it to match the curve of the Blueprints 25 element that I stamped it on, then added a few sequins as a final detail. Hi all! 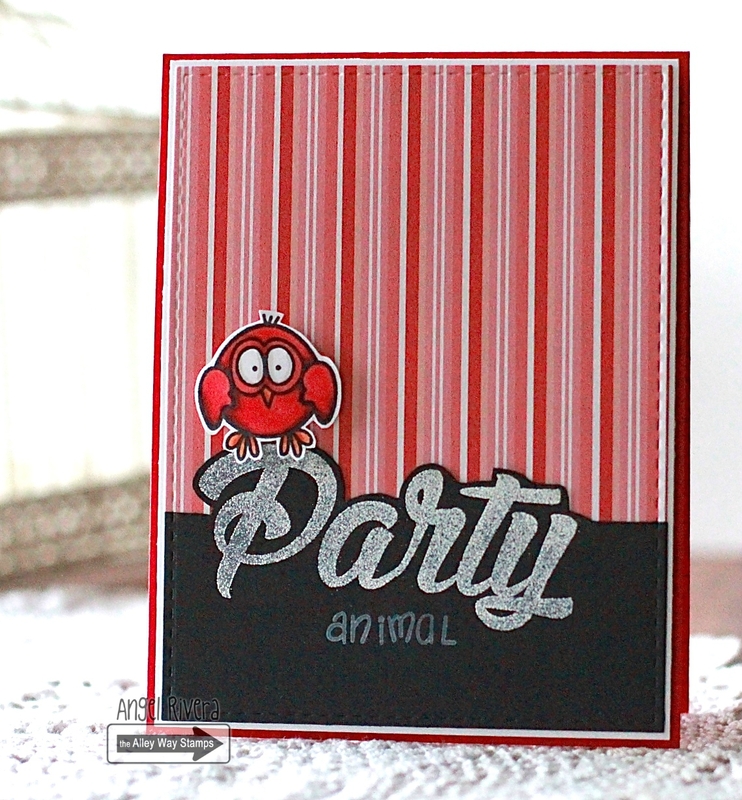 Here's a card I made using the TAWS FREE when you spend $40 set this month called Party Pooper. ;D It's such a super cute mini set! I colored this guy and the balloon with Copics then fussy cut them both and popped them up on foam adhesive. The sentiment is from the It's My Party set. I curved it on my acrylic block so that it went along with the curve of my circle die. A few pieces of sequins from the Caribbean selection add extra detail. 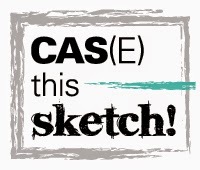 The sketch is the SSSC286. Hi all! Here's my card for the MFTWSC245 sketch. 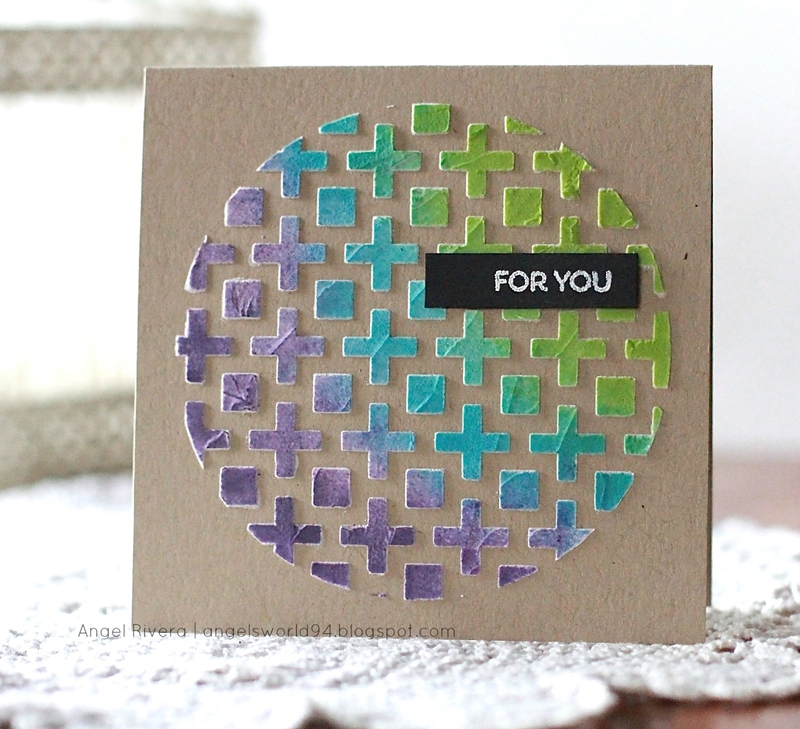 I created the center background by sponging on several colors - blueberry, summer breeze, lemon drop and wild cherry. I wanted to create that sunset on the beach feeling. On the kraft layer, I stamped one of the leaves from the Tiki Party stamp set in kraft pigment ink then heat set it. Next, I took my W1 Copic and colored in around the leaves so that they stood out. It's a nice subtle look and I just love how it turned out! The tree is also from that set. I colored it with Copics, then fussy cut it. The sentiment was embossed with white EP. This card measures 4 1/4 x 4 1/4. Hi all! 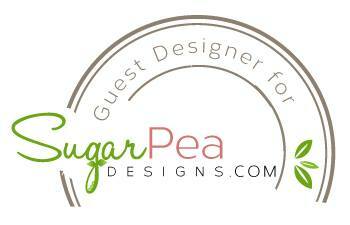 Here's a card I made for the SugarPea Designs SugarSketch 29. I love a good sketch and just couldn't pass this one up! 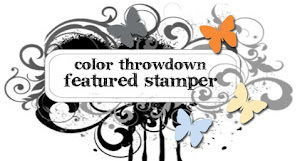 I adore this super cute dragon from their Blow Me Away stamp set. I colored her with Copics and also used the colorless blender to add extra spots ;) I fussy cut the image, then popped it up on foam adhesive, then did the same for the piece of cake she's holding. The sentiment is also from the set. 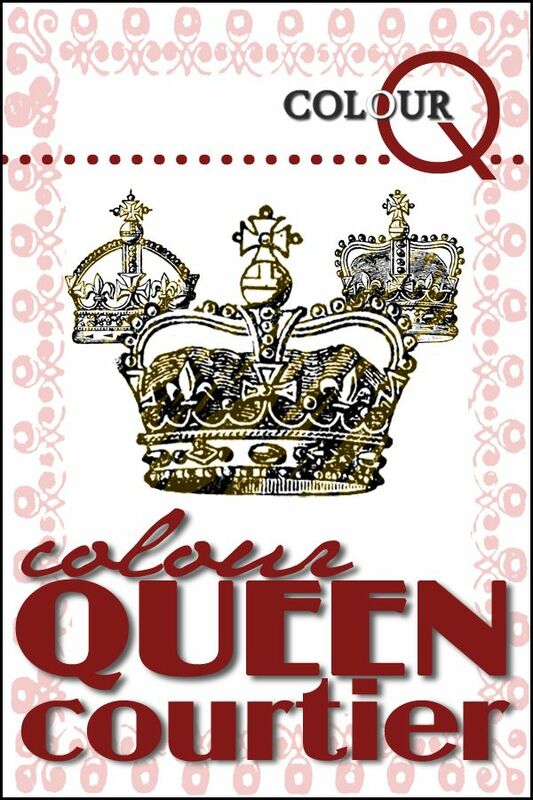 I stamped the words separately so it would fit on the banner. A button with twine and several YNS gumdrops finish it up. Hi all! 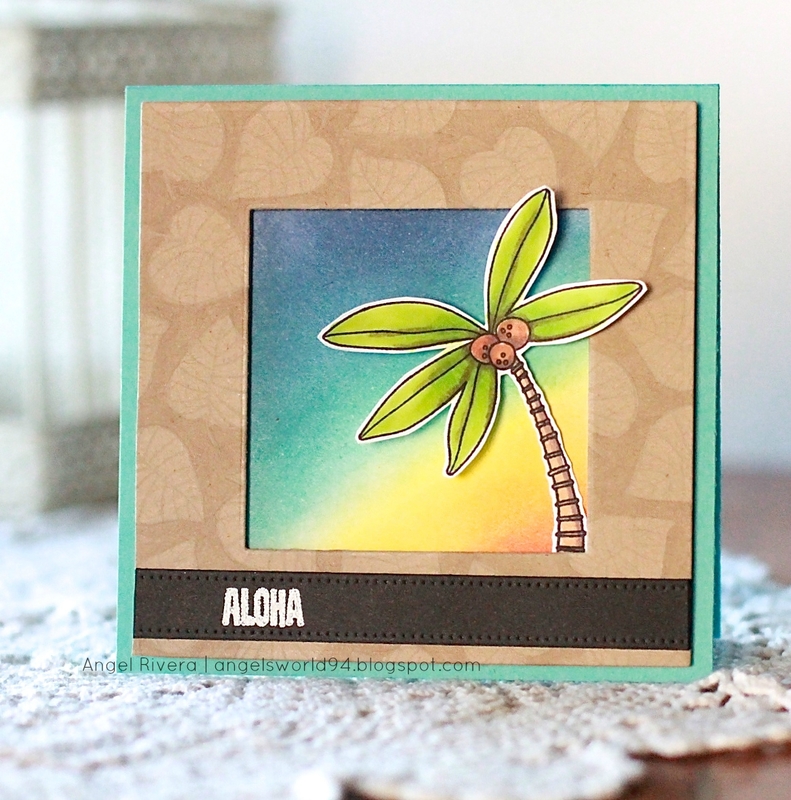 Here's a card I made using some Reverse Confetti stamps and dies. I used their current Sketch for the layout. 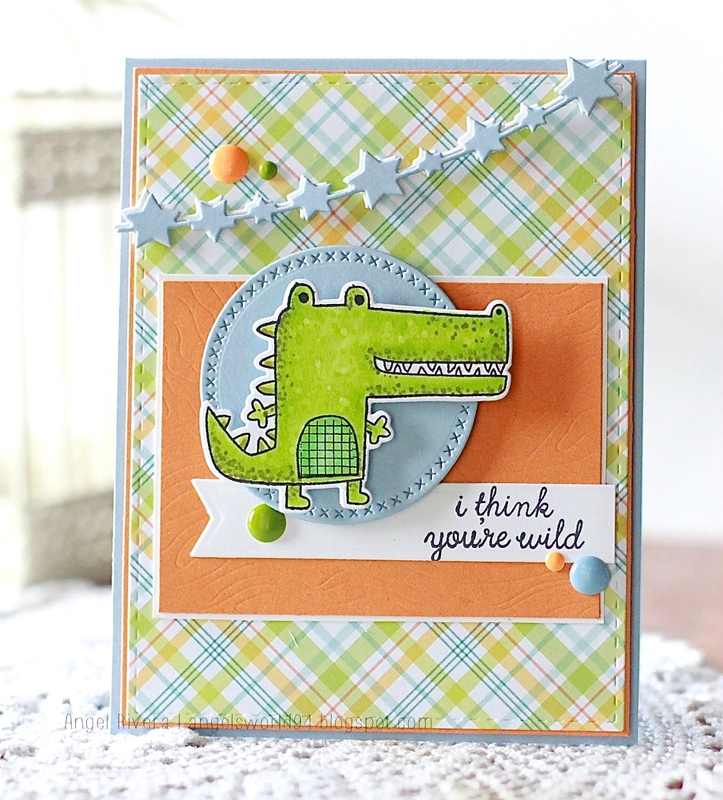 The image and sentiment are from the super cute set Later Alligator and then I used the matching dies to cut my gator out. I colored him with Copics, adding spots with a darker green and also the colorless blender for more dimension. The orange fizz layer was cut out with the Woodgrain Confetti Cuts, but I needed it smaller, so I just trimmed down the edges. I added a layered star garland and some gumdrops for extra details.